Location: The wagon's name is "Gaudreau"
If they release a remastered version of RDR for PS4, I'm buying that game all over again! So worth it! Heads up if you have Playstation Now, RDR is being added to the library on Dec 6th. It's crazy to see that this thread was created back in 2016, lol. This game looks just incredible, between Red Dead, Spiderman and NHL 19 I'm seriously considering not buying the Forsaken DLC for Destiny 2. To me it seems that Destiny is going back to the model where if you don't play it 24/7 you will be left behind and I really don't want to limit myself to only one game. It is fun to raid with friends but honestly I have way more fun playing EASHL and then if it's true and RDR does have a battle royale mode, I'm pretty sure that would seal it for me. 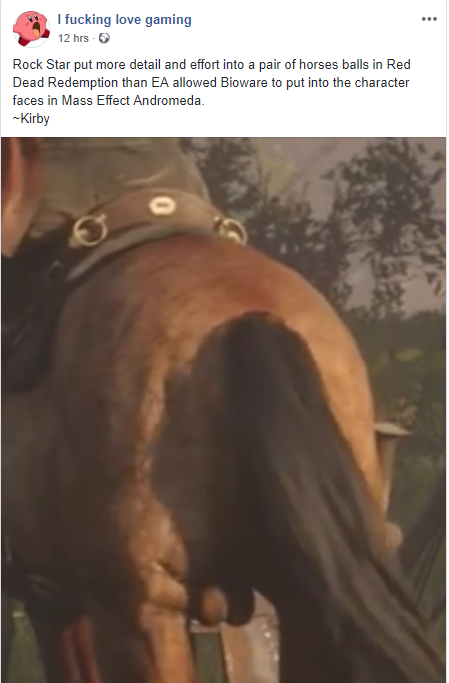 I'm excited to see more about sharp shooting and the new Dead Eye system, if it's explained as well as this gameplay trailer looks then maybe I will pre-order RDR before reviews are released, lol. I'll wait and pick up Forsaken when it goes on sale sometime in the new year. Is it not being released at all for PC, or just 2-3 years afterwards? We don't know. Someone who worked at Rockstar did put on their LinkedIn that it was coming out for PC and then edited it. That could have been an accidental leak or they just copy and pasted a previous job and forgot to take out "PC". I was all “oh, with the other games coming out, I’ll probably wait on this one” before. The smiling of the face, the singing of the cat. I really want this on PC but I have PS4 to tide me over. I think the PC market is to big not to do it eventually, especially if they consider doing Red Dead Redemption online. Looking at Rockstars history there's now way they don't release on PC, just at a later date like they usually do. The last two big titles they never brought to PC are Midnight Club LA and the original RDR, 10 and 8 years ago. Like, I’ve got this roving gang who are always going to be asking me for help with mundane side missions. Sounds like it could be aggravating, like the ‘friends’ from GTA4. And I have to pet my horse to make sure he doesn’t run off or make it so I lose control of him at crucial moments? Don’t like that either. Maybe just nit-picking but it’s the debut gameplay trailer and chose to focus on those two things that don’t exactly scream ‘fun’ to me. How does the number of playoff games the Bruins won *this last season* have anything to do with their number of draft picks in the last three calendar years? I am hoping that they skipped out on gathering flowers in the trailer because they eliminated it from the game! Pretty sure there won’t be more pre-orders on Amazon, they had it up for $50 in June 2017 so I think they were all scooped up. Looks like you'll need one long before I will. May I suggest deflection king? I know about 3 guys who have bought GTA V 3 times. That game must have a huge gross sales.